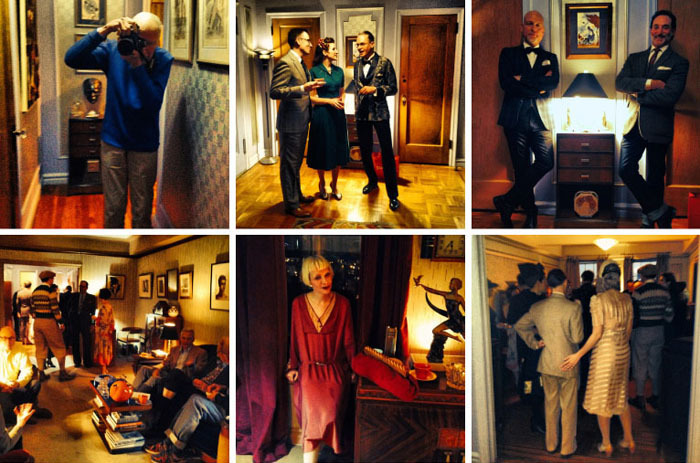 ROBERT BRYAN'S NEW YEAR'S DAY TEA & BILL CUNNINGHAM'S "FACADES"
Yesterday, on the way to Robert Bryan’s annual New Year’s Day tea (in his perfect period apartment, in the Ageloff Towers, where everyone is dressed in period 1930s), who do we come up in the elevator with? – New York treasure and most tireless fashion photographer, Bill Cunningham. It was quite the event and as you can see Mr. Bryan’s aesthetic is shared by his many friends – everywhere you looked was a perfect little vignette. Cunningham started the photo series (below) in ’68 called “Façades”, which documents the history of architecture and fashion in the city by juxtaposing models (mostly his friend the late photographer Eddita Sherman who just passed away at 100 last year) in vintage outfits in and around New York's most iconic historic buildings and locales. When he finished the series in 1976, Bill donated 88 of the photographs to the New York Historical Society, and now they are putting them all on view in “Bill Cunningham: Façades” which runs March 14 through June 15, 2014, highlighting how the city has changed over the last 35+ years. I can’t wait to see it. Years ago Josef gave me an out-of-print copy of the book that I MUST get Bill to sign, but I really hope they reissue it. It’s a real treasure, like the man himself. I hope he lives to 100 like Eddita (he’s 84) – I can’t imagine New York City without him. If he’s not there, how will you know if you’re at a good party or not?